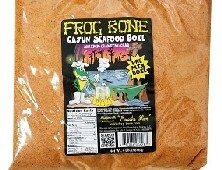 Home > Search A-Z > Frog Bone > Frog Bone Bayou Cocktail Sauce, 12 oz. Frog Bone Bayou Cocktail Sauce The Frog Bone Bayou Cocktail Sauce is a twist on the classic seafood sauce. This sauce has an exceptional blend of ingredients that gives this sauce just that little extra kick. Frog Bone Bayou Cocktail Sauce is certainly not your average cocktail sauce. What should I use it on? Cocktail sauces are most known for being used as a dipping sauce for shrimp and oysters. Many people will also use it for other types of seafood to add flavor and use in place of ketchup. Where did it come from? Shrimp Cocktail, the dish where cocktail sauce originates, was originally served with shrimp hanging around the edge of a cocktail glass. This is the origin of the name. In most American oyster bars, cocktail sauce is the standard condiment for raw oysters. The standard ingredients are ketchup, horseradish, hot sauce (Tabasco, Louisiana, or Crystal), Worcestershire sauce, and lemon juice.